I have no much hopes left for elections in Armenia under current circumstances. I know that at the end it will be the ruling Republican party and related to them & ex-president Kocharyan Prosperous Armenia party that will have a majority share in the next parliament. This is the first election in Armenia when political parties or their reps are being questioned by civil society activists and some media outlets on their attitude towards LGBT rights as part of election campaign. Of course, we are not there yet when LGBT Armenians would be perceived as powerful force that could influence the election results. For this we need free and fair election system in place, and much more vocal and open presence of LGBT people in the country. However, this is a step in the right direction. 4 political parties/alliances (out of 9 participating in this parliamentary election) replied to the pre-election survey of the “Partnership for Open Society” initiative: Ohanyan-Raffi-Oskanian (ORO) alliance; Yelq (“Way Out”) alliance; Free democrats; and ARF Dashnaktsutyun. They all answered ‘Yes’ to the question on whether LGBT people should have the same rights as other citizens. However, I will never trust that ARF Dashnaktsutyun in Armenia genuinely believes in equal rights of all citizens until and unless they come clean re their high level reps support for DIY firebombers. Instead of reprimanding them, those homophobic reps remained on the highest positions in the party's Armenian branch and even got promoted to the ministerial level within the government as part of their alliance with the ruling Republican party. Of course, it’s one thing to answer ‘Yes’ to a non-binding general question, it’s another thing to find out the substance of their stance. lgbtnews.am keeps doing great job in challenging MPs, NGOs and other politicians and civil society representatives in Armenia on LGBT rights. In the context of upcoming parliamentary election, they questioned so far ORO, Yelq and Congress/PPA alliance reps. The most straightforward answer was presented by ORO rep Hovsep Khurshudyan. To note, Hovsep of Zharangutyun (“Heritage”) party consistently (and not only during election period) supported human rights issues in Armenia, including LGBT rights, although it is not clear whether his views represent views of the alliance or rather some in Zharangutyun party. I have no doubts that head of Zharangutyun party Raffi Hovhannisyan genuinely supports LGBT rights too. I will never forget his appearance in front of gay-friendly DIY bar in Yerevan soon after firebombing. However, I have no idea, for instance, what ex-MoD Seyran Ohanyan’s views are regarding this matter. Congress/PPA alliance (LTP) rep Arman Musinyan did not clearly answer to the similar question although in general terms voiced firmly against discrimination of all citizens. Questioned more specifically re LGBT rights Yelq rep Alen Simonyan reiterated the position of their alliance about equal rights and human rights for all but resisted attempts to single out any specific group. Great seeing continuous public support for LGBT rights by the US embassy in Yerevan and personally by US ambassador to Armenia Richard Mills. On March 17, U.S. 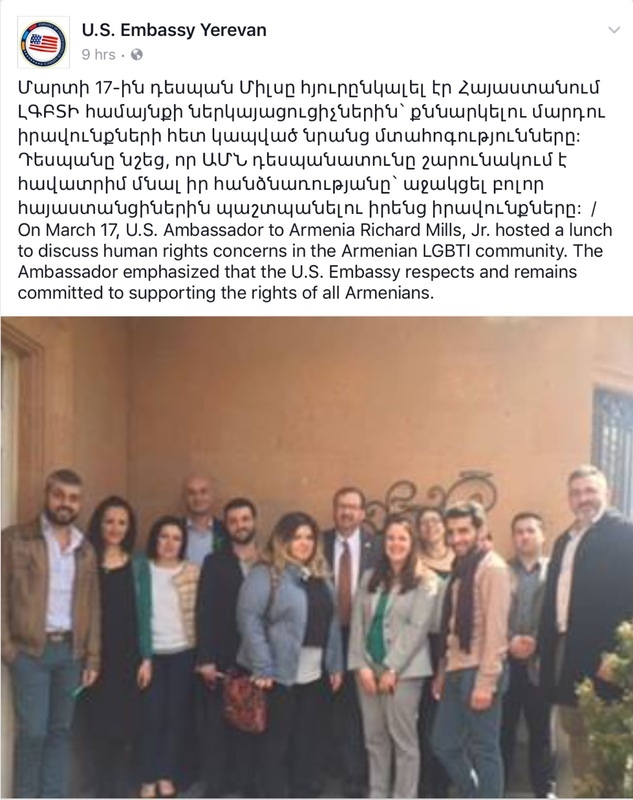 Ambassador to Armenia Richard Mills, Jr. hosted a lunch to discuss human rights concerns in the Armenian LGBTI community. The Ambassador emphasized that the U.S. Embassy respects and remains committed to supporting the rights of all Armenians.